If talking about baby back ribs could make one giddy, this is the recipe to bring it out in me. I haven’t been this excited about a recipe since at least Monday. Think Father’s Day. 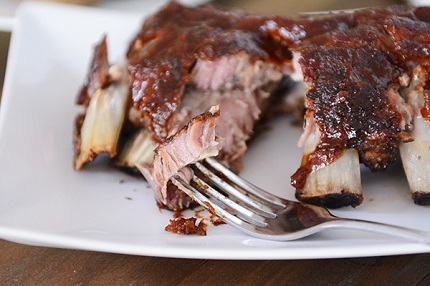 What better idea for Father’s Day dinner than ribs? I happen to personally be a huge fan of ribs. Which just goes to show that you don’t have to be a father to love ribs, and furthermore, ribs shouldn’t be shoved into the men-only corner of the food world. Am I right or am I right? It’s easy to be intimidated by the messy, saucy, tender, boney things, but the truth is, ribs are so easy and so flavorful. And if they are prepared the right way, you get crazy delicious thrown in there too. 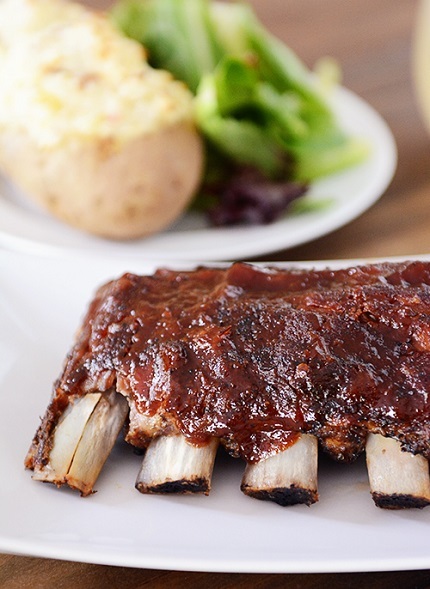 This old oven-baked ribs recipe has been a favorite in our house for years. But if you are looking for a slow cooker version with an amped up semi-homemade BBQ sauce (root beer forever! ), today’s recipe is for you. The only disclaimer I have to offer for this baby back ribs recipes is that thanks to the magic of the slow cooker, the ribs are unbelievably tender — so tender that it’s almost impossible to pick them up like traditional ribs. We still ate them with our fingers (because why not?) but the meat was literally falling off the bone without any effort on our part. 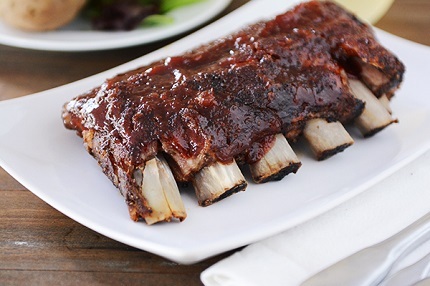 You could most definitely resort to knife and fork here or even cook up the ribs, slide the meat off the bones (honestly, it will take .5 seconds because it’s so, so tender) and serve the flavorful chipotle-root beer sauce slathered over just the meat. No bones. On a huge platter. Set in front of my plate. Heavens, these ribs are fantastic. Ok, let's talk. Baby back ribs are simple to prepare but you do want to make sure you remove the membrane/silver skin from the underside of the ribs. Here's a simple how-to; the trick is using a paper towel to help grip the membrane as you peel it off. Also, when it comes to root beer, brand matters. Choose a root beer that tastes good. Sounds silly and simple but it's really important. We're A&W fans around here; as long as you like the taste drinking it straight, you're good. Finally, slow cookers. I used my 10-year old oval slow cooker that I think is right around 6-7 quarts. 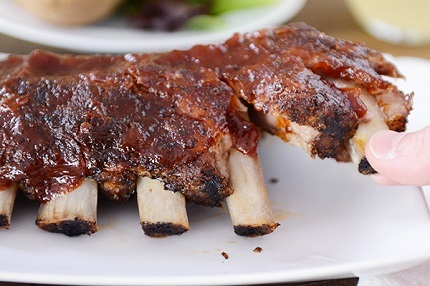 The oval shape is ideal for these ribs; however, I still had to cut them in half so if you only have a round slow cooker, try cutting the ribs into smaller pieces and stacking them on top of each other or side-by-side. For the ribs, in a small bowl stir together the salt, oregano, garlic powder, black pepper, chili powder and paprika. Make sure to remove the membrane from the back of the ribs (simple how-to here). Spread the spice mixture over the meaty side of the ribs and rub gently until coated. Add the sliced onion and 1/2 cup root beer to the slow cooker (see note above for sizes/details) and place the ribs on top, cutting the racks of ribs to fit if needed. Cover the slow cooker and cook on high for 3-4 hours or on low for 6-7 hours. While the ribs cook, make the sauce by heating a saucepan over medium heat with the 1 tablespoon oil. Add the onions and garlic and cook on medium to medium-low, stirring often, until the onions soften and turn translucent, 7-8 minutes. Add the root beer and bring the mixture to a boil. Let it cook for 5-7 minutes until the liquid is reduced by about half. Stir in the BBQ sauce, vinegar, brown sugar, minced chipotles and Worcestershire sauce. Season with salt and black pepper — start with 1/4 teaspoon each and add more to taste. Simmer the sauce for 10-15 minutes. Let it cool slightly and then carefully process in a blender (or use a handheld immersion blender) until smooth. Refrigerate the sauce if making in advance. When the ribs have finished cooking, preheat the oven broiler and position an oven rack about 4-6 inches from the heating element. Line a large, rimmed baking sheet with foil. Carefully lift the ribs from the slow cooker using a large, flat spatula and tongs (they will be very, very tender — like, fall-apart tender) and place them in a single layer on the baking sheet. Brush liberally with the prepared BBQ sauce and broil until the sauce bubbles and caramelizes, 2-3 minutes (watch closely so it doesn't burn). Serve ribs with the remaining sauce on the side.